Designer April Cornell was presented with the 2018 Gift and Home Trade Association/Gift for Life Honor of Excellence award at the ICON HONORS event at AmericasMart Atlanta on July 12 during the Atlanta International Gift & Home Furnishings Market. Cornell has built a unique brand featuring colorful prints and timeless designs inspired by her travels and now available on a plethora of products. Her foundation, The Giving World, provides funding for health, education, women and children in the developing world. The ICON HONORS – produced and staged by AmericasMart Atlanta annually – recognize achievement in the gift and home industries. This year's event was emceed by CNN's Nick Valencia and featured an address by Arianna Huffington, founder of The Huffington Post and CEO of Thrive Global. 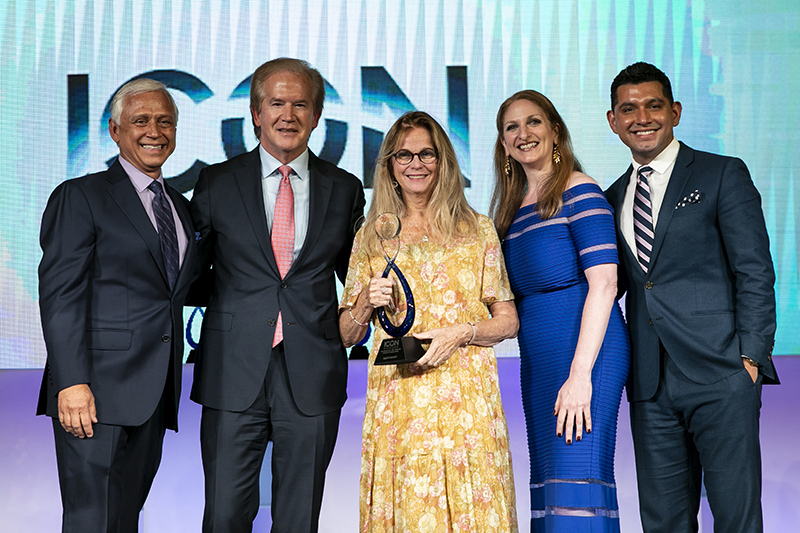 GHTA/GFL Honor of Excellence Award winner April Cornell (center) with (from left): AmericasMart's George Kacic and John Portman, Jr., HFN's Andrea Lillo, and CNN's Nick Valencia. The 8th annual "Up on the Roof" gala benefitting Gift for Life takes place on Monday, July 30, in the WorldView Ballroom on the 16th floor of Building B, during the Summer 2018 Las Vegas Market. This year's fundraiser will be themed "ERASE HATE: A Celebration of Love," with proceeds benefitting The Gay & Lesbian Community Center of Southern Nevada. The event will feature a full bar, hors d-oeuvres, dancing, a silent auction, entertainment and more. Up on the Roof tickets, which cost $25 each or five for $100, are available online here or at specially designated kiosks onsite in the Grand Plaza, C10, and in the Pavilions during the Las Vegas Market. The 2018 event also will memorialize the 20th anniversary of the death of Matthew Shepard. In addition to attending Up on the Roof, Matthew's mother, Judy Shepard, will appear at a special "meet-and-greet" and will be signing copies of her book, "The Meaning of Matthew, My Son’s Murder in Laramie and A World Transformed," in the Fine Lines showroom on C10 on Monday, July 30, from 11am-4pm. 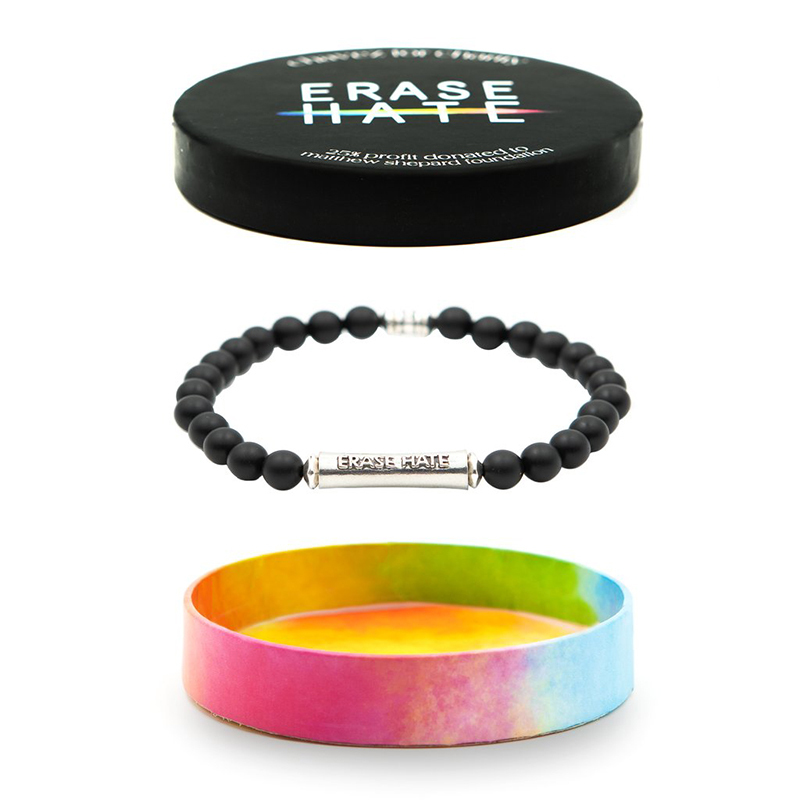 Chavez for Charity, also located in the Fine Lines showroom, will be offering "ERASE HATE" merchandise, including a special limited-edition unisex bracelet, for which a portion of proceeds will go to the Matthew Shepard Foundation. "ERASE HATE" bracelet from Chavez for Charity. 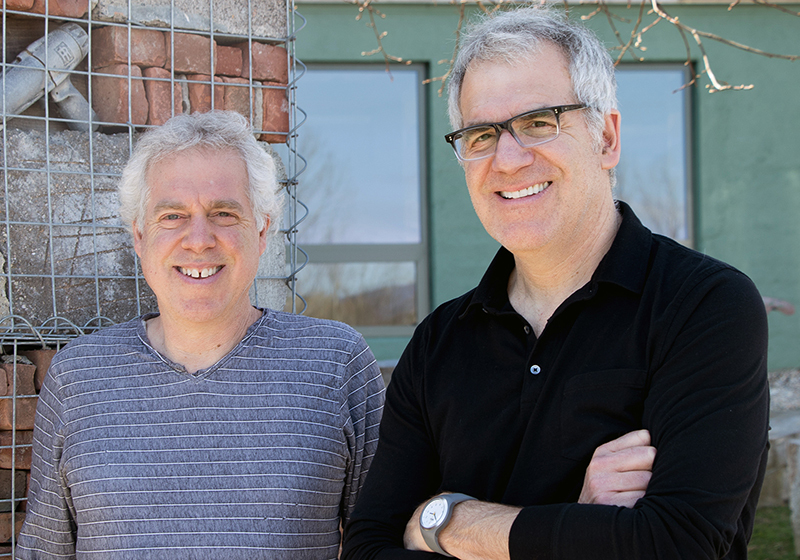 Gift for Life's 2018 "Industry Achievement Award" will be presented to Blue Q founders Seth and Mitch Nash at Gifts and Decorative Accessories '67th Annual Retailer Excellence Awards on Sunday, Aug. 12, at The Lighthouse at Chelsea Piers in NYC, during NY NOW. Blue Q was founded in 1988 with a single item, the cardboard "Flat Cat"; today, the company offers an array of high-quality novelty items. The REAs recognize retailing and individual achievement in the gift industry. In addition to the presentation of awards, the event will include a cocktail hour, strolling dinner, and dessert. Single tickets are $185, with a portion of proceeds donated to Gift for Life, and can be purchased here. Additionally, GFL is collaborating with Progressive Business Media/Gifts and Decorative Accessories to launch its first-ever "text-to-give" campaign in connection with the 2018 REAs. Donations are being accepted now through Aug. 12 and will directly benefit JBT Foundation (Just Been Tested) – an organization using social media and technology to promote HIV/AIDS testing and awareness. To donate, text the code 4LIFE to 1-844-544-7171. A text reply will provide a secure link where donations can be made; a credit card is required. Blue Q founders Seth and Mitch Nash. Become a Sponsor for Party for Life 2019! Sponsorship packages are now available for the 27th Anniversary Party for Life, taking place on Monday, February 4, 2019, at Stage 48 in NYC during the now-co-located NY NOW, National Stationery Show, and SURTEX tradeshows. 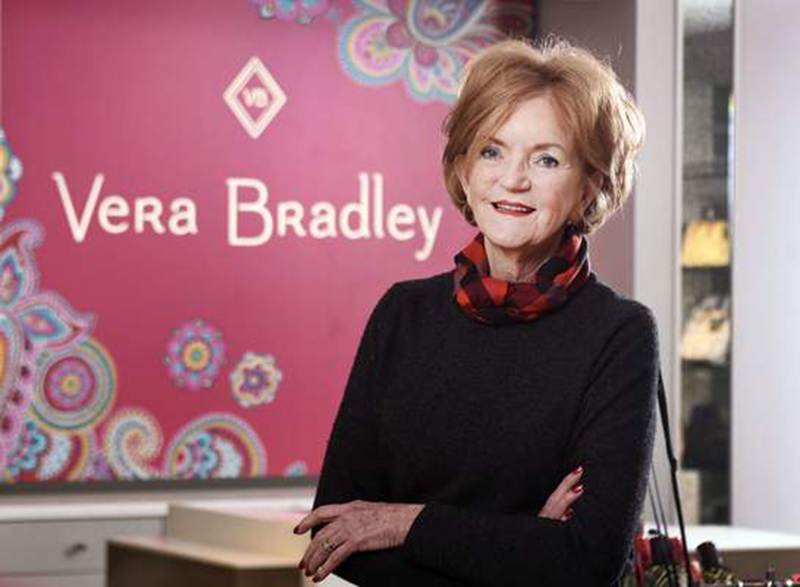 Barbara Bradley Baekgaard, founder of Vera Bradley, will be honored at with Gift for Life's Chuck Yancy Lifetime Achievement Award at this annual event, which will feature dinner, cocktails, music, dancing, a silent auction, and the opportunity to network with industry peers. Bring your friends, your colleagues, or your whole team! To become a sponsor, click here. Vera Bradley founder Barbara Bradley Baekgaard. "This is an organization that makes a difference in the lives of individuals who need help. I've been a board member for more than 10 years because I see how our fundraising and advocacy actually helps people. I also love how supportive the industry continues to be and how we apply many of our 'work' skills in the service of an important cause. But most important, it's the people that make Gift for Life great – the board members, our charitable partners, volunteers, and supporters across the industry." GFL Board Member Cole Daugherty. Each year, DIFFA invites three of New York’s most prestigious schools to create design installations for DINING BY DESIGN New York. The Student Design Initiative is supported in part by the Angelo Donghia Foundation. Under the tutelage of cutting-edge industry mentors, these student teams were guided through the creative process from conception to execution while working within a strict budget. This year, the students created a "Red Room" table installation that was "a visual representation of the HIV/AIDS awareness movement, incorporating cylindrical elements to create a sense of unity and a celestial aurora that emphasized the feeling of hope and prosperity," according to 2018 student designer Anna Harea. In addition, students were given the chance to join DIFFA in the fight against HIV/AIDS by weaving the cause into their designs to help raise awareness to the DINING BY DESIGN audience. For further information, click here. 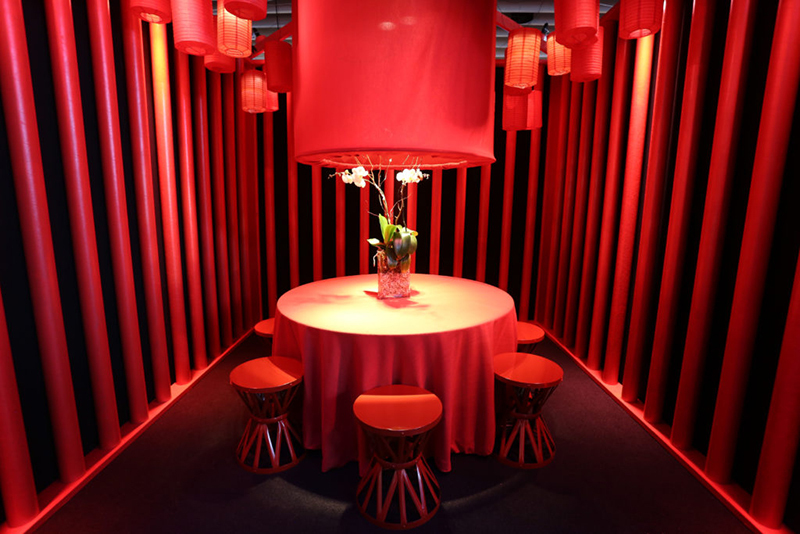 The "Red Room" at DINING BY DESIGN New York. Dawn Roberson has been appointed as the new Executive Director at DIFFA: Design Industries Foundation Fighting AIDS. 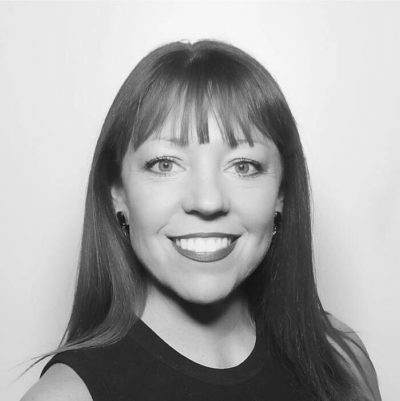 Roberson previously served as DIFFA's Event Director, where she successfully executed the Foundation's local and national fundraising events. She launched DIFFA's first grant reception – Thanks for Giving – which united 200 DIFFA supporters and grantees. For additional information, click here. 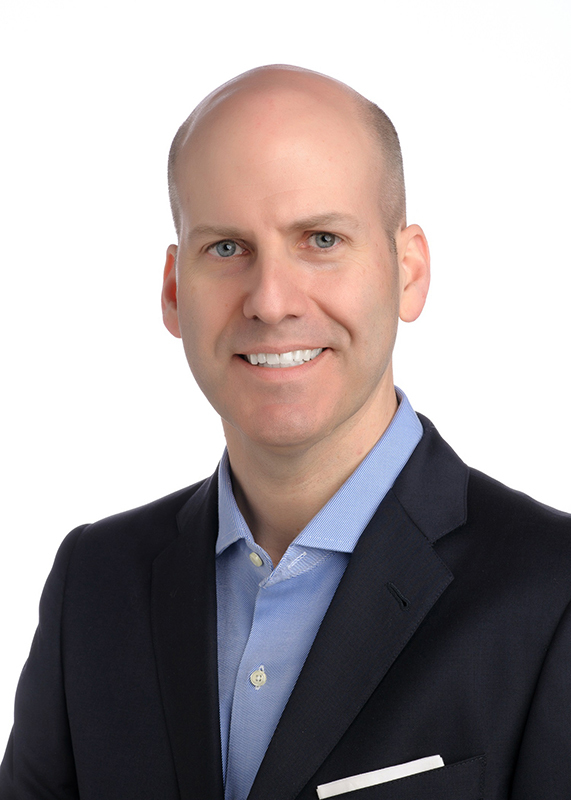 Additionally, Steven Williams has been promoted to Associate Director at DIFFA. He has served in various roles at DIFFA since 1995, most recently as Program Director, and has worked closely with Gift for Life. DIFFA Executive Director Dawn Roberson.